Bulkhead kicked off MSTRKRFT's show at Montreal's Théâtre Fairmount last night (December 2), playing a competent mix of deep house and techno. Although the audience was shy at first, people started warming up halfway through the opener's set, cheering occasionally for their thumping — if a little static — tracks. While they stood at an extremity of the short riser, it was hard to ignore the hardware punctured with colourful wires that sat not too far from them, unused. At the hour mark, MSTRKRFT took the stage, seamlessly taking over for the rest of the evening. As unassuming as the EDM duo tried to make the transition, the crowd still cheered as soon as they set foot on stage. It seemed not that long ago that they were playing on huge festival stages and giant nightclubs, so it was exciting for their fans to see them under the disco lights of a more intimate rock and roll venue. MSTRKRFT used to be known for their docked synths and relentless cowbells, a signature they perfected on their remixes of some of the most popular tracks of the late '00s. After a seven-year pause, they released Operator earlier this year, an acidic techno album that skilfully avoided feeling like a cheesy comeback. This metamorphosis was reflected in their live configuration, the band ditching their CDJs of yore in favour of a setup that included modular synths, a Roland drum machine and a laptop. Their set list was similar to the one captured on their recent album Live at the Phoenix. Starting with sprawling untitled jams and tracks from Operator, the duo cast their spell on their public, a mix of older fans and younger techno aficionados mingling enthusiastically on the dance floor. Half an hour in, MSTRKRFT started playing the first notes of "Neon Knights," a track from The Looks, their first album. It was greeted with instant cheers that were renewed when they followed up with a twisted version of their 2007 classic "Easy," which quickly evolved into a techno jam. The rest of the evening was focused on distorted house and crunchy EDM, sometimes spliced with vocal samples, as on "Playing With Itself," "Runaway" — one of the set's highlights — and 2009's "Fist of God." It was sometimes hard to determine where their recent material ended and where their improvisations began, tracks like "Wrong Glass Sir" and "Little Red Hen" already feeling like explorations in their album incarnations. Although they had a visible passion for their craft, the group didn't quite display the showmanship they used to in earlier shows. More interactions with the public would have been a welcome addition. Nonetheless, MSTRKRFT played, with contagious smiles, well past the Fairmount's usual curfew, as their set grew more abrasive and abstract. Not everybody was there for the last portion of their extended set, but those who stayed were glad they did. 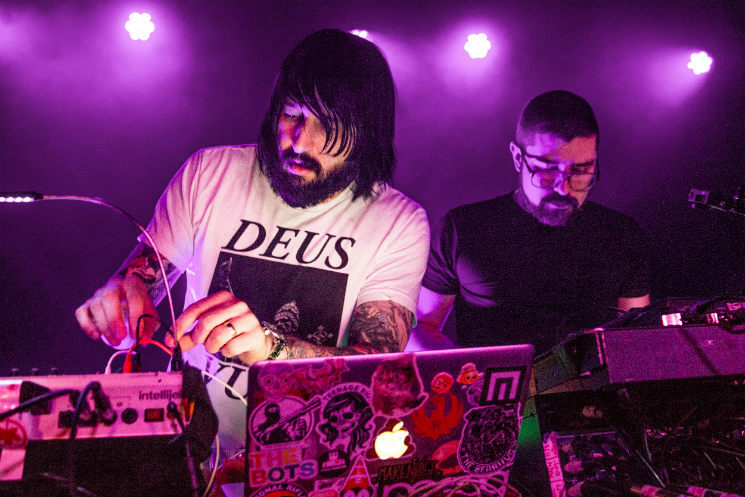 MSTRKRFT Surrender to the Machines on 'Operator,' a "Masterpiece of Editing and Assembly"